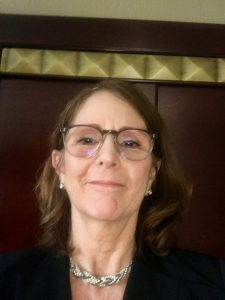 Grand and fantastic is how I describe my experience as a competitor in the Toastmasters District 12 International Speech Contest in Temecula on May 12, 2018. No, I didn’t win. Didn’t even place, but I did my best. I didn’t forget my speech, didn’t trip walking across the stage, didn’t fall off the platform, and didn’t have lettuce from the delicious lunch in my teeth. Overall, I pulled it off and feel good about it. However, I was running out of time. The red light flashes at the seven-minute mark, and then we have 30 seconds to wrap it up. If we go over 7 minutes 30 seconds, we’re disqualified. So, I omitted three lines toward the end of the speech. Those lines are in bold print in the body of the speech below. The audio for the first 40 seconds of the video is too soft. I think my husband, George, might have had his finger over the tiny microphone. This was the first time he used the iPad Mini to record something. I, too, have a knack for covering the mic with my finger. It’s located right where we hold the edge of the iPad. He could have used a cell phone, but if anyone calls, it stops the recording, and we didn’t know how to prevent that from happening. I was fortunate to get a recording even if the quality is poor. George was in the very back of the room, so my face isn’t visible, but viewing this video will help me improve on future speeches. “I’m so happy to be here, I feel like dancing. But first things first. I have good news and bad news. We’ll start with the bad news: Alzheimer’s Disease may soon outpace heart disease. Currently, there’s no known cure. “There’s a good chance everyone here knows of someone who’s affected by this condition of the brain wasting away. “This is personal for me. My father has Alzheimer’s. Dad is a thin, short man whose comical antics are a big hit on the dance floor at wedding receptions. My once-brilliant father is declining into a state of constant confusion. I wouldn’t wish such a fate on anyone. “Now for the good news: I’m going to share fun ways we can reduce our risk of getting this dreadful disease. “To name a few: reading, playing board games, and dancing. 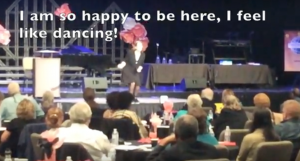 “An article in Getting Healthier titled ‘How Dancing Can Prevent Alzheimer’s Disease’ addresses how creative thinking helps improve memory and brain function. “If you’re not sure which new skill to learn, I highly recommend juggling. According to Nature Magazine, juggling increases gray matter. “I’m still learning. My left hand is a loose cannon. The tosses are wild. Get ready to duck! “There are so many variations to juggling, you’ll never run out of new skills to learn. Try standing on one foot. (Oops – Drops one bean bag.) I told you I’m still learning! “Two bean bags with one hand. (Oops! Drops both bean bags and laughs.) I’m still building gray matter! “Juggling and those other activities involve creative thinking and reduce our risk of dementia. “Say what? You mean we can ward off the heart breaking, brain-erasing disease by participating in fun, stress-relieving activities? Yep! “Sports activities such as swimming and bicycling reduced the risk of dementia by zero percent. That may surprise you. However, keep in mind this particular study focused only on the brain and not on the benefits of cardio workouts. “Reading reduced the risk of dementia by 35%. “Doing crossword puzzles 4 days a week reduced the risk by 47%. “Dancing frequently reduced the risk by 76%, specifically ballroom dancing such as the Foxtrot, swing, waltz, Tango, and Latin. “Ballroom dancing applies all of those brain functions and calls for rapid-fire responses, which create new neural pathways. It’s as if the brain is performing mental gymnastics. “I have more good news. There’s no talent required. Regardless of having two left feet, no sense of rhythm, and no experience dancing, our brains still improve. We reap the benefits while learning new skills. “Stimulating the brain while learning new skills is key, especially skills which call for split-second decisions. “There’s even more good news. 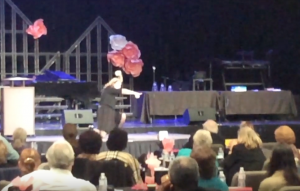 In case you’re unable to dance, other experts are studying the benefits of singing to fight dementia. “What a nice variety of activities to choose from to reduce our risk of Alzheimer’s and dementia. You’ll never get bored if you mix it up. “Remember, talent is not a prerequisite to learning new skills and you don’t have to master your new skills to improve your brain. “A new skill can be a new sport, a new hobby, a new game, anything you haven’t learned yet, or variations of the skills you already know. “Let’s practice our new skills as often as possible. “I’m going to dance with my father every chance I can get. The photo was taken prior to the awards announcement. The three winners just happened to be standing in the order they placed. It was a pleasure to meet these amazing people. I only wish I’d been able to hear each of their speeches, but I was off to the side in a hallway and only caught bits and pieces while focusing on calming my nerves. 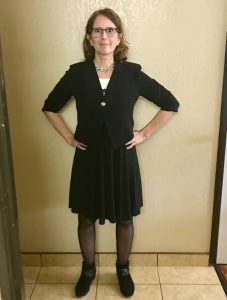 The Wonder Woman power pose helped me calm my nerves prior to giving my speech. Lisa Wright, 1st place winner, will go on to compete in the semifinals at the 2018 International Conference in Chicago, Illinois, August 22 to 25. Good luck, Lisa! 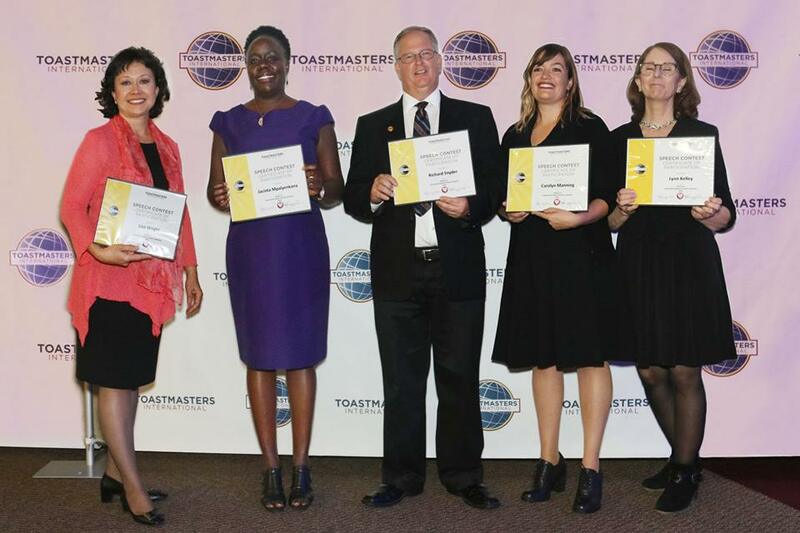 I learned a lot about Toastmasters speech contests these past few months. There’s always room for improvement. In Part 2 I’ll cover mistakes I made so you won’t have to learn the hard way. First and foremost, we’ll cover the importance of learning the contest rules. What are your thoughts? Is competing in a speech contest something you’d want to do if you have an important message you want to share? Do you learn from your mistakes? I’d love to hear your thoughts! 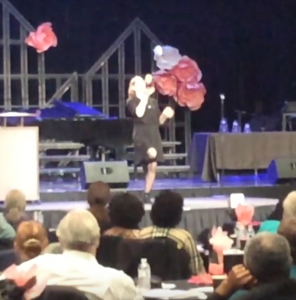 This entry was posted in Grammy Gets It, Health and Wellness, Lynn Kelley, Toastmasters, YouTube Video and tagged Carolyn Manning, district level Toastmasters International speech contest, international speech contest, Jacinta Mpalyenkana, Lisa Wright, Richard Snyder, Toastmasters. Bookmark the permalink. 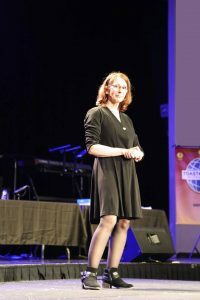 9 Responses to District 12 International Speech Contest – Part 1 – What a Grandastic Adventure! Way to go just getting yourself out there to compete!!! Your a winner in my eyes!!! Thank you, Susie! I never could have seen myself doing something like this five years ago. This is so far beyond my comfort zone, it’s insane! 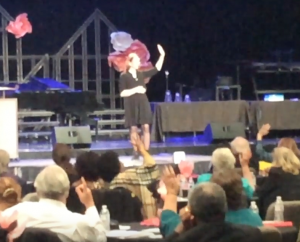 As it turns out, I discovered I love being on a stage sharing important information! So nice to see you here, my friend! Well said, Yvette. It was an amazing learning experience and a huge boost for my self-confidence. I didn’t know if I could do it, and now I know I can! The Wonder Woman pose is very helpful. Thanks for stopping by, Yvette Triple Threat! Thanks so much, Pambelina. It was an amazing experience! Wonderful ! Just getting out there is quiet the accomplishment! Thank you, Maria! I feel like it is quite an accomplishment, for sure. This has been a major event in my life. So exciting to have been able to participate in it!